Visit the Del Mar race track, where the surf meets the turf for the world-famous Del Mar horse races in San Diego. The 2018 summer season is Wednesday July 17 - Monday September 3 (Labor Day weekend), and the fall series is from November 9 to December 2 2018. All year long, there are special events at the race track, such as BBQ and chili cookoff, tacotopia and salsa contests, pizza and beer fests, and more. Known for its’ familiar slogan “Where The Surf Meets The Turf in Del Mar” here is one of the “must do’s” to add to your list while visiting San Diego. Make your way to Del Mar race track! Opening day is mid July each year and over 40,000 fans are expected to attend. There is still plenty of time to lay down your bets and have some fun. Ladies you can still don you hats and have a great time out with friends or family. By all means celebrate in style! Based on prior years, admission for Stretch Run is approximately $6.00 and Clubhouse Admission is $10.00 (subject to change; additional price on opening day). Racing season runs through Labor Day weekend (early September). The Del Mar horse races start at 2:00 p.m. on Wednesdays, Thursdays, Saturdays and Sundays. The first four Fridays begin at 4:00 p.m. and each Friday after at 3:30 p.m. The gates open 2 hours before the first race. You are sure to enjoy the fast horses while placing your big bets. Curious how it all got started? Well the Del Mar Race track opened its gates in 1937 after the forming of the partnership between Bing Crosby, the actor Pat O’Brien, Jimmy Durante, Charles S. Howard and Oliver Hardy. The racetrack prides itself as an American Thoroughbred horseracing track. Bing Crosby sang about it and just about everyone knows the words and will chime in when they hear, “Where the turf meets the surf in Del Mar”. In 1937 Bing himself would personally greet the fans as they entered the gates to the track. While the track was a playground to many famous Hollywood stars it is most famous for its exciting race between Charles S. Howard’s Seabiscuit and the Bingling Stable’s colt, Ligaroti. 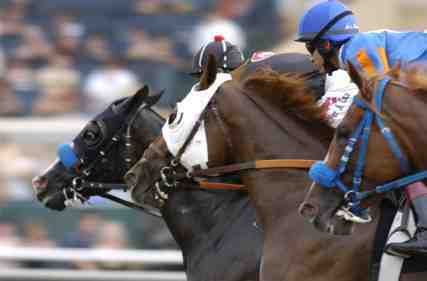 Of course we all know Seabiscuit won that race by a nose! So….get your keys in hand and get ready to go. 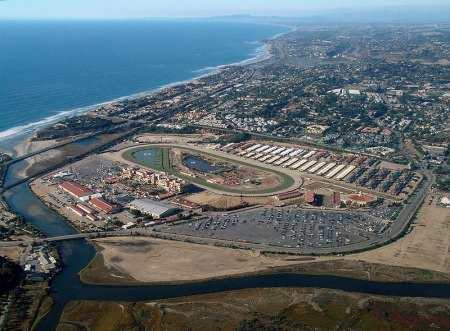 The Del Mar Race track is located at the San Diego County Fairgrounds. It is roughly 20 miles north of downtown and 100 miles south of Los Angeles. You will want to take the Via de la Valle exit just south of Solana Beach and head towards the ocean. You will have no problem once you are headed west. Just follow the other racetrack goers and plan for the time of your life. Plan to arrive early due to traffic and parking, or avoid the hassles and take the train. Driving Directions - From Interstate 5 at Exit Via de la Valle and head west. Take the fist left onto Jimmy Durante Blvd. Follow the signs for parking.